The standardized testing season will be here before you know it. Whether this time of year excites you or frightens you, it’s time to prepare your students for the big test. Teaching them test-taking vocabulary can really help. Not only will your students perform better on the text, they will also gain confidence in their abilities to understand and respond to difficult questions. Read on for some fun and effective strategies to try with your students. When taking a standardized test, there are three things your student must be able to do. understand what the question is asking them to do. If they struggle in one of these areas, their chance of being successful on the assessment drops big time. 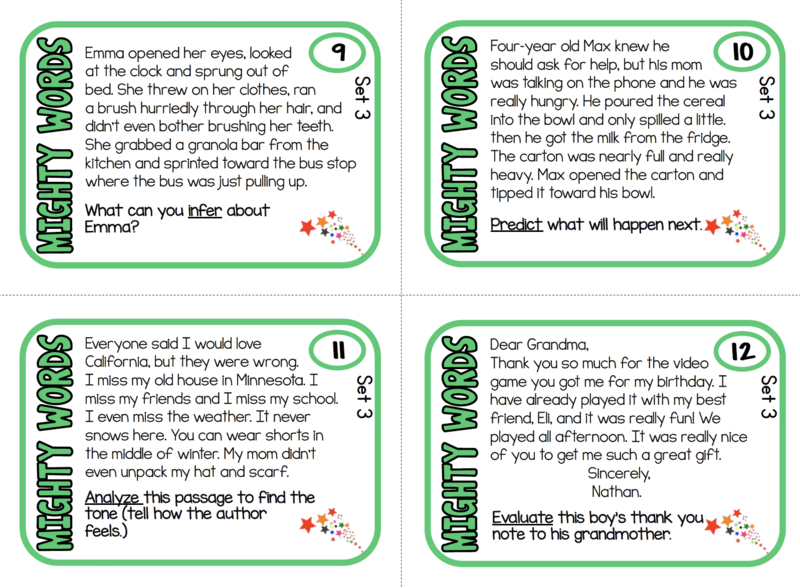 It’s easier to explain this concept with examples, so here are a few pulled from the Mighty Words Task Cards Set in my Teachers Pay Teachers store. What should you do if you are asked to explain why a day on earth is 24 hours long? Formulate a plan to earn some extra money. Can a baby panda survive without its mother? Support your answer with evidence from the text. The words in bold are test-taking vocabulary words. They are examples of words frequently used in test questions as well as critical thinking activities. Understanding the meaning of these words will cut down on mistakes, as long as your students have the content knowledge. Students are often intimidated by the pressure of testing season. That’s why building their knowledge of test-taking vocabulary in an enjoyable way is their best bet for giving them the confidence they need on test day. Teachers and students alike are fans of task cards. Students enjoy them because they are usually more fun and less intimidating than traditional worksheet activities. Teachers love them because limited preparation is required, and there are countless ways to use them in classroom lessons. 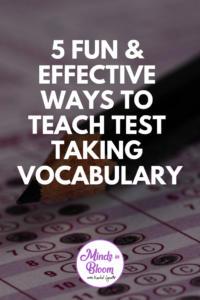 Here are five ways to teach-test taking vocabulary with task cards that will be a hit for you and your kiddos. Give your students a variety of cards with words that are similar to the test-taking vocabulary words. Their goal will be to match the related word with the correct task card. You can find a list of related words for each test-taking vocabulary word here. 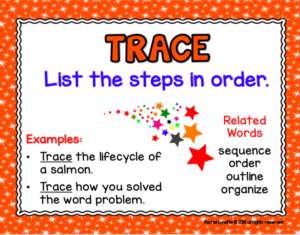 For example, a task card with the word “trace” would be related to sequence, order, outline, and organize. When students make the connection between the test-taking vocabulary word and similar words, they will grow know what to do when they encounter them on the test as well as in other situations. Complete the activity individually, as a small group, whole group, or in centers, though I recommend allowing students to work collaboratively to encourage discussion. Everybody loves Jeopardy. Add task cards and test prep to the mix and it’s a recipe for a great lesson. Start with a digital Jeopardy board or a low tech version using a pocket chart, and split the class into two to four teams. Then, sort the task cards based on subject and difficulty. You know how the game goes. Students earn points based on the value of the question. Jeopardy provides them with the opportunity to practice answering questions collaboratively while you formatively assess their understanding. This activity can be done in small groups or as a whole class review. When students arrive at school, before they leave for the day or as they’re finishing an assignment, you can give them a task card to complete. Use this activity to assess comprehension quickly. Do this activity with the whole class by displaying the task card with your document camera. Complete this activity individually so you can gauge an understanding of each students’ ability level. Whether your class uses Kagan Cooperative Learning Structures, or other cooperative learning formats, giving students structured group work to encourage collaboration is a great way to use your task cards when practicing test-taking vocabulary skills. 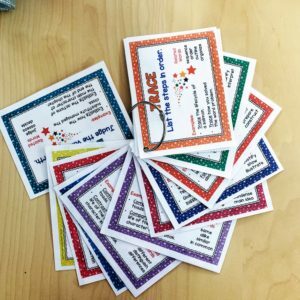 Give each student a task card. Students walk around the room while holding their task card. You yell “pair” and students find the person closest to them to be their partner. Each student reads their card, and their partner answers, then vice versa. Students switch cards with their partner and steps 2-5 repeat until time is up. Would you like more details about the structure of this activity? I wrote a separate blog post all about it. This activity gives students the opportunity to practice answering many different questions while moving around and collaborating with their classmates. While they are working, you can circle the room and listen to their conversations as you take anecdotal notes. You should complete this activity as a whole group. As students get in line to go to lunch, resource, home, etc., put up one task card on the board or read it aloud. Give each student an index card so they can write their answer to the problem. As they get in line, they should show you their response. This provides you with a quick understanding of who needs additional support and who knows the test-taking vocabulary. You can then differentiate your review based on the responses you receive. You can complete this activity with your entire class or with a small group of students who need continued practice with a particular type of question. 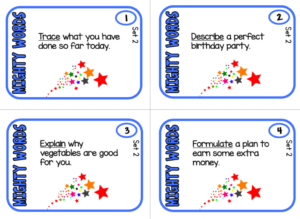 You can use the Mighty Words Poster and Reference Cards to choose a word of the day. Each day, pick a new test-taking vocabulary word and use it in various subjects. Contrast how to find the area of a square and a triangle. Read both passages and contrast the characteristics of the main characters. Contrast the reasons for World War I and The Civil War. How can you contrast the life cycle of a butterfly and a tree? 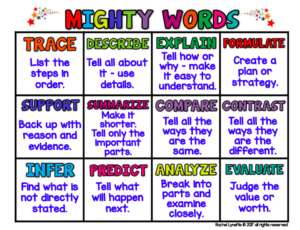 Using the word across different subjects is a great way to continually provide your students with the practice needed to grow their vocabulary and build their confidence. Now, do you feel more prepared to tackle test-taking vocabulary prep? You can get the task cards and the test prep posters mentioned in this post here and here. Or, if you’re a true task card fan, you can grab the money saving-bundle. 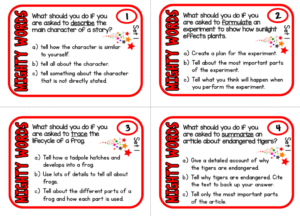 How will you use task cards in your classroom during test prep season?